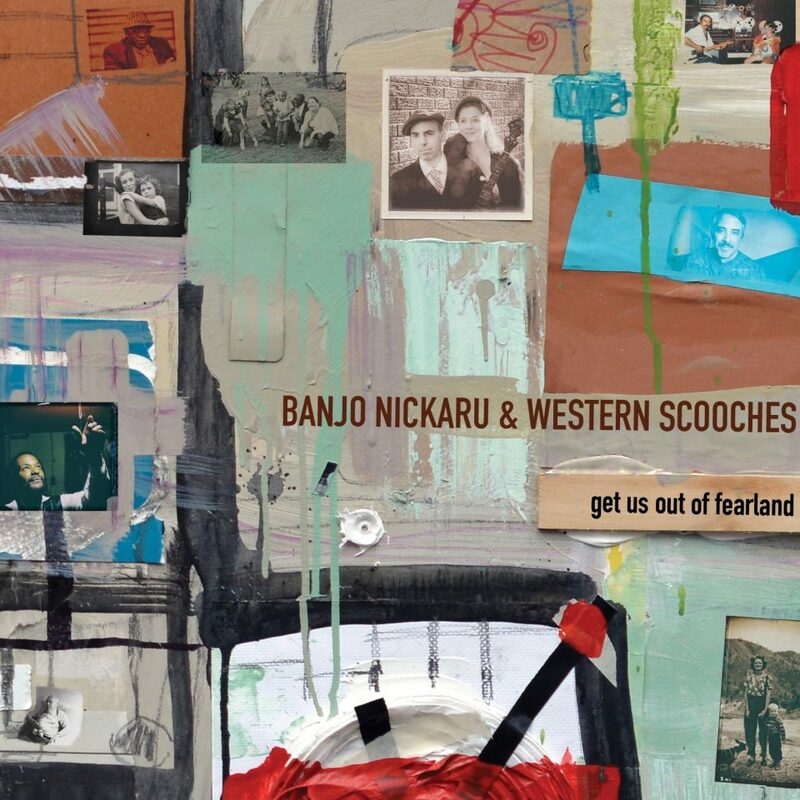 Banjo Nickaru & Western Scooches sophomore album Get Us Out Of Fearland: #2 album, #2 artist, #5 song with 6 of our songs in top 20 on April 2018 International Folk Music DJs Radio chart! Led by Betina Hershey and multi-instrumentalist Nick Russo, the album features standout work from musicians from New York, Suriname, Mexico, and Sapelo Island, who have performed live on NBC affiliate KSHB-TV, for the Extended Play Sessions (Alternate Root TV) and on nationally syndicated shows such as Woodsongs, and Blue Plate plus stages such as Kansas City Folk Festival, Club Passim, Rockwood Music Hall, Isis Music Hall, WFUV, John Platt’s “On Your Radar” and Jalopy Theatre. Band members have performed with artists such as Paul McCartney, Paul Simon, Julia Roberts, Willie Nelson, James Taylor, Jerry Garcia and Wynton Marsalis. Plus they have made appearances in movies such as Disney’s “Enchanted,” “Mona Lisa Smile,” “Away We Go” and PBS Masterpiece, “The Chaperone.” The band had a 2017 NERFA semi-formal showcase and their debut album Very Next Thing was #6 Album (#5 Artist #7 Song) on the International Folk DJ Radio Chart 2016. Highlights of Get Us Out Of Fearland include the playful 1920s verve of “I Don’t Need No Glasses,” the warm lilting embrace of “I Wish The World Knew Why,” the organ-driven, gospel-tinged “Dandelion” (featuring special guest singers Stephanie Rice and Charenee Wade), and “Soar,” an inspirational song filled with optimism, determination, and perseverance. These qualities sail skyward throughout the 25-minute journey, but none more so than on the boisterous groundbreaking title track, which features improvisational vocalist Miles Griffith, known for his work with Max Roach, Paul Simon, and Reggie Workman, plus percussionist/vocalist, Dr. David Pleasant, a singular talent who has performed with Wynton Marsalis, Cecil Taylor, and Paul Simon. To support the lead-up to the release of Get Us Out OF Fearland, Russo and Hershey, along with accomplished percussionist Emiliano Valerio, who appears in four songs on the album, will play 15 showcases at the world-renowned Folk Alliance International Conference, which celebrates its 30th anniversary, Feb. 14-18, in Kansas City, MO. Last year, the group was a breakthrough act at the conference, receiving a special invitation to open the main stage of the Kansas City Folk Festival the next day.